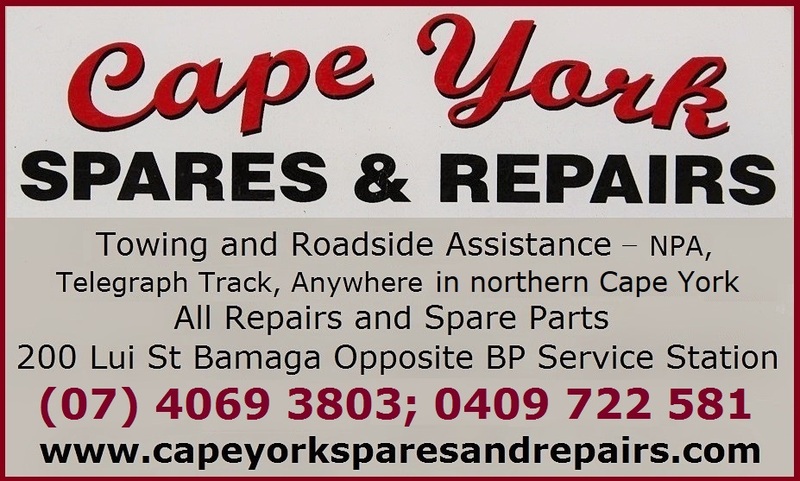 We have four freshwater and five marine Australian turtles in Cape York. The freshwater species are small and live in the inland creeks and billabongs, while the marine species are large and live in the ocean. 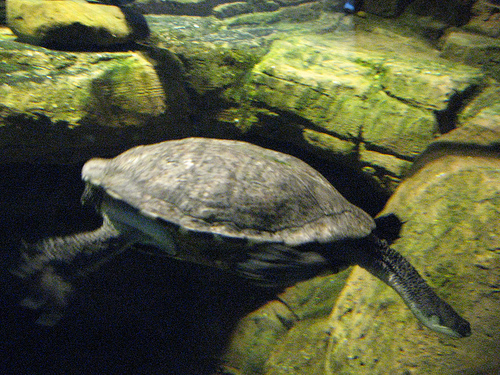 The freshwater turtles are much more numerous and easier to spot, while the marine turtles are much less common to see, and face various threats. Their eggs are eaten by monitor lizards and feral pigs, and most of the hatchlings are taken by birds, crabs and fish. Adults can get killed when striked by boats, get caught in fishing nets, or mistaking a plastic bag for jellyfish and swallowing it. 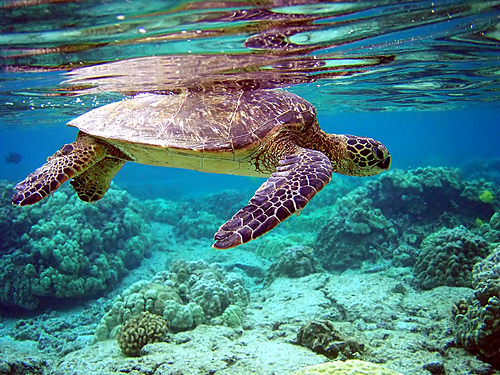 Green turtle is one of the most common Australian turtles and it is found along the coast of northern Australia between Shark Bay in the west and Eyre Peninsula in the east (which is all the way to South Australia). Even world wide it has a large distribution that reaches to temperate waters, however its nesting sites are in the tropics. Loggerhead Turtle is another common marine animal, with a very similar distribution between Exmouth and Adelaide in Australia, and until the temperate waters world wide, but a little more coastal (less in the open ocean) than the green turtle above. 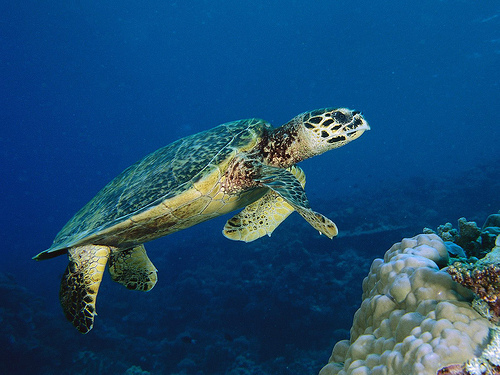 Hawksbill Turtle has a little smaller distribution between Ningaloo Reef in the west and the coast of southern New South Wales in the east. And world wide it keeps closer to the tropics and doesn't reach to temperate waters. Flatback Turtle is the only endemic turtles in Australia, found in the waters of northern Australia between Broome in the west and Brisbane in the east, and nowhere else in the world. 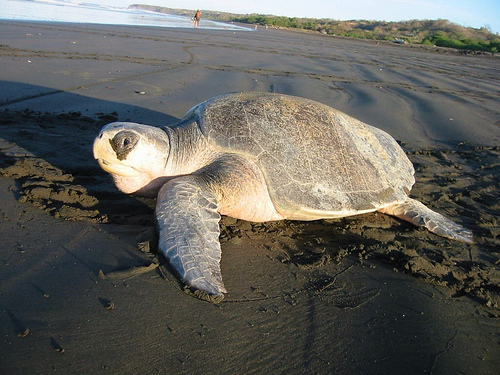 Pacific aka Olive Ridley Turtle has the smallest distribution in Australia, with only the Top End in the Northern Territory, and the northern half of Cape York peninsula. World wide it is in tropical waters and closer to the coasts rather than in the open ocean. 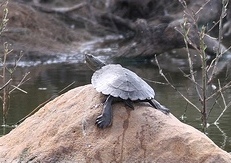 Freshwater turtles are very common in Cape York. 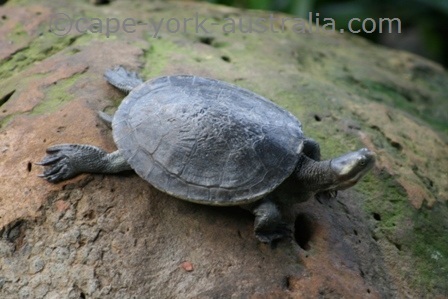 You can often see them basking on the rocks and logs in freshwater creeks, gorges and also river banks. Some are short necked, others are long necked, most are shy animals and will glide into the water when they notice you. 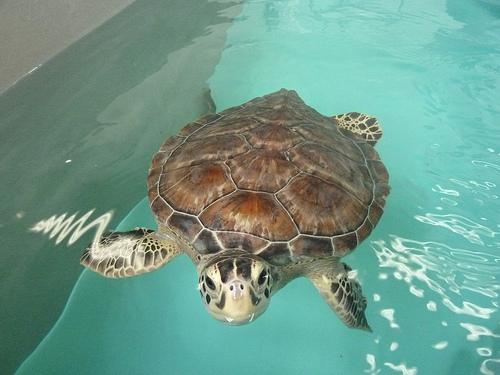 They are much smaller than their marine cousins, however with a 70 year life span they are not much shorter lived. Saw shelled turtle Elseya latisternum is a common one, has a short neck, and is found from Cape York peninsula in the north to northern New South Wales in the south. It eats aquatic insects, tadpoles, small fish and frogs, and it is one of the few native animals that can feed on the poisonous introduced cane toad. Snapping turtle Elseya dentata complex is another short necked one of our freshwater turtles, and it lives in lagoons and rivers in sub coastal Queensland between Cairns in the north and Gympie in the south. It eats algae and other plant material as well as small aquatic animals. Krefft's Short Necked Turtle Emydura krefftii is also one of our short necked freshwater turtles, and it is found in sub coastal Queensland from Princess Charlotte Bay in the north to Gympie in the south (north of Brisbane in sourh east Queensland). 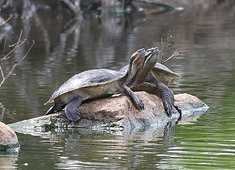 These are two long necked turtles and the one found in Cape York is the New Guinea long necked turtle Chelodina novaeguineae, while the other, eastern snake necked turtle Chelodina longicollis is found further south, from Whitsunday islands to Adelaide in South Australia.